A group of New Yorkers who live near Billionaires’ Row, an area with some of the most expensive residences in the world, filed a lawsuit on Monday to block a homeless shelter from opening in the Midtown West neighborhood. The West 58th Street Coalition sued New York City to stop the conversion of the old Park Savoy Hotel at 158 West 58th Street into a homeless shelter for men, a plan announced by Mayor Bill de Blasio in February. 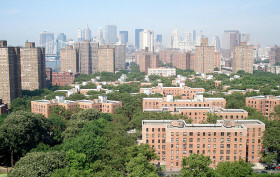 The coalition claims the shelter, which would house 140 single men, would have “an enormous impact on our densely populated, narrow, high-pedestrian-traffic street.” While describing themselves as a group of “compassionate New Yorkers,” the Change.org petition says instead of the city paying $50,000 per person to stay at the Park Savoy, “a homeless man could have his own apartment, living in the neighborhood where he came from.” The new shelter sits behind One57, a known for the city’s most expensive residential sale ever: a penthouse that sold for $100 million in 2015. Officials on Tuesday said the city will spend $384 million annually over the next three years to house homeless New Yorkers in commercial hotels, despite promises to phase out the once emergency-only measure. 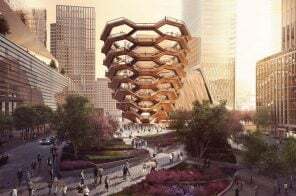 The costs, which will total more than $1 billion, will also include creating supportive services for families, as well as amenities hotel rooms lack, like refrigerators and microwaves, according to the New York Post. Department of Homeless Services told City Council members at a hearing Tuesday that the three-year contract is temporary, but needed as the city continues to open new shelters that will eventually replace cluster sites and other underperforming shelters. Earlier this year, Mayor de Blasio was criticized for failing to open 10 of the 20 homeless shelters his administration pledged for 2017, with “delays in the permit process, time-consuming negotiations with nonprofits that run the shelters, and backlash from the community and public officials” to blame. The push came from the fact that NYC has the largest homeless population in the U.S., climbing near 78,000. All of this coupled together, the situation is now looking even more dire, as the Coalition for the Homeless‘ annual State of the Homeless Report finds that a record high number of New Yorkers make up the city’s nightly homeless shelter population. This number, 63,495 (which includes 23,600 children), would make that group the 10th largest city in the state, notes the Daily News. In 2017, Mayor Bill de Blasio’s administration opened just 10 out of the 20 shelters planned for New York City under an initiative aimed at curbing the city’s growing homelessness crisis. Last February, the city unveiled its “Turning the Tide on Homelessness” plan that included opening 90 shelters over five years, with about 20 shelters each in 2017 and 2018. But, according to the New York Times, the city fell short of its target last year, opening just half the number of shelters planned due to delays in the permit process, time-consuming negotiations with nonprofits that run the shelters and backlash from the community and public officials. Under de Blasio, the homeless population has grown. When the mayor took office in 2014, about 68,000 New Yorkers were without homes. Today, roughly 77,000 people are considered homeless in NYC, with 3,900 on the street, the largest homeless population in the U.S.
Mayor Bill de Blasio plans to open a new homeless shelter for 150 single adult men on Manhattan’s Billionaires’ Row, part of the city’s initiative to open 90 new shelters over the next five years. According to the New York Post, a former hotel at 158 West 58th Street, the Park Savoy, will be converted into the shelter and open in March. 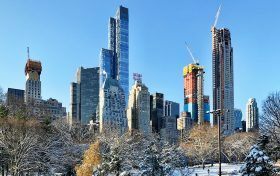 The Central Park South building sits behind One57, a supertall known for the city’s most expensive residential sale ever: a penthouse that sold for $100 million in 2015. Over the past few years, New York City’s homeless crisis has gotten worse. 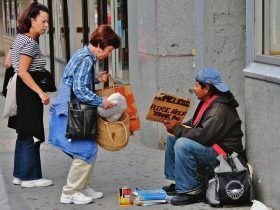 A recent study reported a 39 percent increase in homelessness over 2016, making last year the highest homeless population since the survey began in 2005. 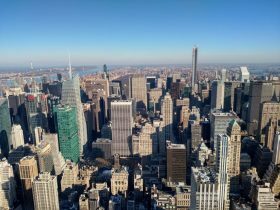 While the city scrambles to address the rising population, a roommate company and nonprofit housing organization recently teamed up to help lessen the burden of New Yorkers who find themselves unable to afford housing. Despite operating on opposite ends of the housing market, roommate matching site SpareRoom partnered with Breaking Ground, the largest provider of supportive housing in NYC, this November. The partnership was suggested by the public after SpareRoom launched Live Rent Free, a contest where the company pays one roommate’s monthly rent and one person’s entire rent for a whole year. 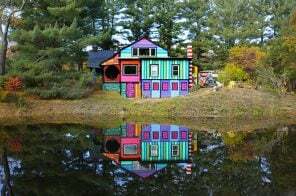 (It was inspired by founder Rupert Hunt’s New York roommate search, in which he found two roomies to share his West Village loft for $1 a month.) The resulting partnership–which is running in tandem with the Live Rent Free contest–matches the monthly prize amount dollar-for-dollar with an in-kind donation to Breaking Ground to fund their Transitional Housing program. So far, SpareRoom has donated $3,314. 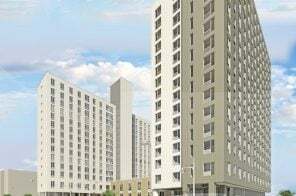 With 6sqft, Matt Hutchinson, Director at SpareRoom, explained why the company felt motivated to address homelessness and its future plans to engage with Breaking Ground. Brenda Rosen, President and CEO of Breaking Ground, also explains how the organization’s Transition Housing program works, and why the homelessness crisis is something all New Yorkers–regardless of what they pay in rent–should be aware of. 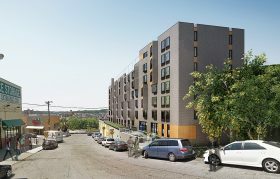 Applications are now being accepted for 24 new affordable rentals at 233 Landing Road in the University Heights neighborhood of the Bronx. The newly-minted elevator building will offer residents a computer lab, a live-in super, bicycle storage, a community room and an on-site laundry room. 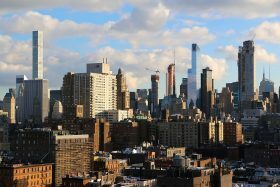 Qualifying New Yorkers earning 50 and 60 percent of the area median income may apply for units ranging from a $714/month one-bedroom to a $1,058/month two-bedroom.